Inbox Dollars Reviews – Legit or Scam? 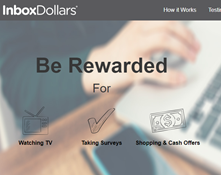 InboxDollars.com is the online home of InboxDollars, a market research company which promises to help advertisers get important feedback from customers while providing an earning opportunity for their members. Market research is one of the oldest ways to earn money online, and InboxDollars is one of the older companies that have been helping advertisers collect their information through online surveys and activities. Their website says that new members can sign up for their service without having to pay any sign up fees, and they will even provide you with a $5.00 bonus just for being willing to try their service. Market research is an important industry which allows companies and advertisers to get feedback from their prospective customers, and one of the ways they do this is by providing people with surveys and activities they do online. Once you have become an InboxDollars member, you will begin receiving their PaidEmails. The number of PaidEmails you receive each day will be based on how active you are with their program. The average member receives three emails with earning opportunities while members who have become inactive for long periods of time will not receive any. These emails will provide a specific survey or opportunity they would like you to complete in order to get paid. Some advertisers will provide their members with additional earnings opportunities if they are willing to sign up for special offers, but InboxDollars promises that these are just additional opportunities – you will get paid your promised compensation simply for completing the original activity. InboxDollars has been around for a very long time so potential members are likely to find many different reviews concerning this company from past members. But the current reality of InboxDollars appears to be that they are a trustworthy company that does honor their payments to their members. There are still a variety of criticisms of this company that potential members might want to consider before they sign up, however. The biggest concern is that when you sign up as a member of this company, the first surveys that you will receive will pay very little and may seem like they simply aren’t worth your time. Some members have said that as you continue with the company, the surveys you receive will go up in compensation, but it still seems as though each individual survey will pay out less than a dollar. This means that customers must understand that this is simply a way to earn extra money each month – not a way to replace your day job. Average Rating for " Inbox Dollars Reviews " is 2.12 out of 5 based on 51 reviews. Y'all say I won money from doing surveys,I never received the money it takes me to another survey to answer I think its a scam. Low points, login doesn't work most of the time, it wants you to reregister and start over. Wouldn't do it again. Not worth the time. I have been a member for awhile now slowly chiseling away towards the $30 needed to cash out when i finally tried to cash out they present this offer to you that if you make $10 more dollars they will pay processing fee for you. so i say what the hey. i make it to $40 9/17 and cash out.. i continue to "play" daily and 9/20 when i opened the app as usual i was totally caught off gaurd everything was set back to zero.. no surveys where loading nothing so i go to log on my laptop and its telling me that my account has been deleted.. i have made several attemots to get ahold of then including chat (which basically just says they cant do anything and dont know why) just have to wait for a response but still after several attempts ii havent gotten one.. I been doing inbox dollars for a few years now. I also do other survey sites for extra money. I'm hoping to earn enough to eventually get a good used car. The one that I have is old but runs. I am disabled and it's going to take a while to build up on surveys to get one. I recommend this company but you have to be patient as their checks are not sent through paypal. They send you your checks through snail mail. This outfit has really gone downhill. Offers that result in spam, TV app claims I have an ad-blocker running, and I don't. Surveys are hard to qualify for and etc. I have been a long time member but no more. i enjoy tv videos.but they( inbox dollars)will choose a survey for me.when completed never shows i got rewards for it??? I have been using inbox dollars for over a year. I would of gave it five stars, but I have been used by th surveys...I spent over 15 min answering stuff and after I answer a bunch of stuff they tell me I don't qualify! Then when I spin I have won 25cents and in two different occasions they never paid me my spin winnings lol. Other than that the site is fablous! I recently won $50.00 bucks with the sweeps and in the beging of the year I won 5 bucks. My $50 dollar winning came in pretty fast, and it was perfect timing because I was getting ready to go on vacation to Disneyland....thanks inbox dollars!